Now, when it comes to the repainting of heritage buildings, I'm very subjective and quite judgemental as far as the results are concerned. Basically, though, the main rule of thumb I apply as to whether I like the result or not is whether the fine architectural details of buildings are just covered in a swathe of paint, or used as part of the final paint job and shown off by the new colour patterns. Exhibit A comes from home -- the 1938 Avondale Post Office, designed by Llewellyn (Llew) S Piper. I don't know how it was originally painted, but in the 1990s, under Avondale's Mainstreet Programme, it was repainted using three colours, with details accentuated, as seen below. The yellow when first done was brighter, but not too much. Now, no longer a Thai restaurant, new owners are giving the old girl a refit and make over this month. I do like the results so far, because the detail around the windows and along the low parapet are being recognised and picked out in grey. Folks in the community I've spoken to feel this looks quite smart. Hopefully, if no one bowls the Unity Building (1932) opposite, whatever landlord that comes along treats it just as kindly. 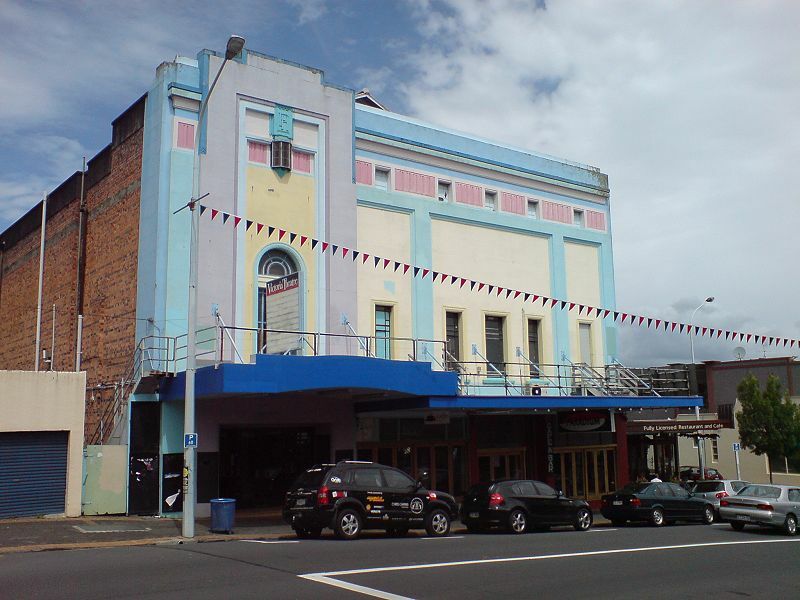 Then, we have exhibit B: the Victoria Picture Palace Theatre in Devonport. It used to look like this (below). Described as "lolly-pastel", this exterior paintwork at least looked bright, true to period, and showed off architect Daniel B Patterson's 1929 facade detailing. But, I suppose because it was "lolly-pastel", it had to go. Image from WikiCommons, by the way. So, now there's this (below). The details are still there, but they're now visually washed out by the sun reflecting off all that gleaming white. This building has now added another dislike to my set of personal opinions: I wasn't fond of old commercial and public buildings painted totally black, and now the Victoria Cinema has added solid white to that lack of preference. In an age, today, when we realise that the ancients didn't just have white buildings and white statues (even the Romans used colour for details) -- the Victoria Cinema's cheerful seaside hues have been obliterated. Below, from the "History of the Victoria Cinema" poster displayed on the outside of the building, are Patterson's details as designed. We once had a Victorian era house and we used two greens and a cream to show detail. The front of the house was very sheltered, so the paint work lasted. Just after we sold it, it was painted all white. So boring. Fantastic post Lisa it's great to see the old Avondale Post Office being cared for like that. I hope the Unity buildings remain. Many Good memories for me. Love the Theatre too. Yes, I totally agree with your sentiments; the post office looks much smarter and more 'complete' in its new set of clothes, while the solid white is unimaginative, cheap and nasty. Used to shudder when a particular gold rush-era pub in Bendigo changed hands (it had new owners approx. every 2 years) the paint brush would come out and the results were getting worse and worse each time. It's pretty average at the moment, too. Thanks for the comments, folks. Maybe they just ran out of ideas, and wanted a "strawberries & cream" theme to the cinema. More strawberries needed, less cream. My partner used to own an historic building which he turned in to a restaurant in Onehunga...you wouldn't believe the hassles he had trying to get the Council to allow him to paint the outside of it ... he is sympathetic to historic causes and has a great love of things historical as i do. We are both members of the Historic Places Trust. Sometimes Councils do buildings a disservice, especially when people have gone to major lengths to keep things as original as possible! Interestingly i remember the outcry when the Peacock fountain was renovated and reinstalled in the Christchurch Botanic gardens a few years back...original colours and people hated it..i LOVE it ..it has such character. I'm off to London for 3 weeks [a bit of work thrown in]! Catch you soon if not during! Keep up the great work! What?! Those naysayers have no soul -- that is a gorgeous fountain! I'll pop that link up in a separate post, Sandy, it's worth it. Cheers. I agree with you totally about the bland white paint job that has been done on the theatre. A building full of interesting facade detail has been denied expression. We have a building here in Palmerston North -Square Edge- where a repainting job has maybe gone too far to the opposite extreme: it is very bright- all the facade details stand out- but there is no sense of context with surrounding buildings. Ohmigosh, Kiwi Nomad! That's just ... just ... hang on, that merits a post and link back to your blog. Back in a tick. Maybe I will have to send you the way of some of our better-painted buildings though as well!!! Our Regent Theatre for instance I think is divine. Do you have a link to exterior shots you can share with us?